If you are a teacher, a student or a parent of student in the UK, you know how great it is to have the week off in October. It is a great time to rest and recharge in the time period between your hectic summer and the Christmas season. Here are 4 fun ways to spend this October half term. London is the capital city of the UK and there are so many fun things to do in this historic city. You can check out the beautiful architecture and go on tours of exciting places like the iconic Buckingham Palace, The Tower of London, or the Parliament Buildings. You can go shopping for a new winter wardrobe in exciting places like Mayfair, Covent Garden or Westfield. Spend your evenings taking in a play, going on a night walking tour, or drop the kids at the movies and enjoy a drink at one of the many historic pubs in the area. Puglia is “the heel” of Italy’s “boot” and it is a great place to go cycling in October. The weather in Puglia in October is pleasant and you can expect low twenties during the day and cooler nights. It is a great area for cycling and you can see thrilling views of the Adriatic Coast, stunning beaches, olive groves, aromatic fennel fields, vineyards, and historic farmhouses. Be sure to explore the enchanting small towns, relax on the scenic beaches, explore the vineyards and sample some of the fabulous food of the region. Make sure you take the time to explore the exciting historic areas of the Trulli District and Matera. You can join guided tours or set up your own route so that you can be more flexible with your time. Here are some other great destinations for a cycling tour in Europe. 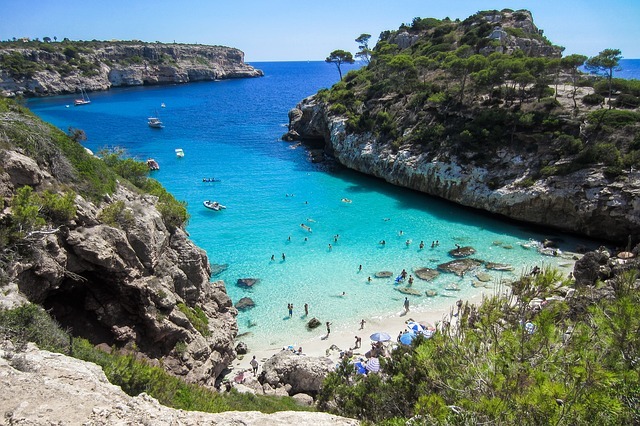 Mallorca is one of Spain’s stunning Balearic Islands and it is a great place to spend your week off. There are plenty of beautiful villas here so that you can have your own private home with a pool, concierge service, and stunning beach access. Be sure to rent a car so that you can easily explore exciting areas like the large underground lake of Cuevas del Drach or the ancient fortification of Bellver Castle. Make sure you spend at least a day relaxing on one of the many beaches that the area is known for. Of course, you don’t have to go away to be able to enjoy the half-term. This could be a super opportunity to fundraise for a charity you care about. As it is half-term, many people will be available, and parents will be looking for fun events to take their kids to. It takes time and plenty of hard work to organize a fundraising event but that doesn’t mean it can’t be fun. The first thing you will need to think about is where you want the money to go. If you don’t already have a charity in mind there are always people who are seeking help. Once you know where your money is going you can plan an exciting event like a dinner, a yard sale, or get a team of people together and raise money by completing a monumental hike or trip. This is a great way to get to know people better and you will feel great about helping someone in need.